Your institution must subscribe to JoVE's Basic Biology collection to access this content. Immunohistochemistry (IHC) is a technique used to visualize the presence and location of proteins within tissues. Drosophila larvae are particularly amenable to IHC because of the ease with which they can be processed for staining. Additionally, the larvae are transparent, meaning that some tissues can be visualized without the need for dissection. In IHC, proteins are ultimately detected with antibodies that specifically bind to “epitopes” within the protein of interest. In order to preserve these epitopes, tissues must be fixed prior to staining. Furthermore, in order for antibodies to penetrate membranes, cells must be permeabilized with detergents. This video article offers a detailed view of the reagents, tools, and procedures necessary for the staining of dissected larval tissues, including fixation, blocking, and staining steps. 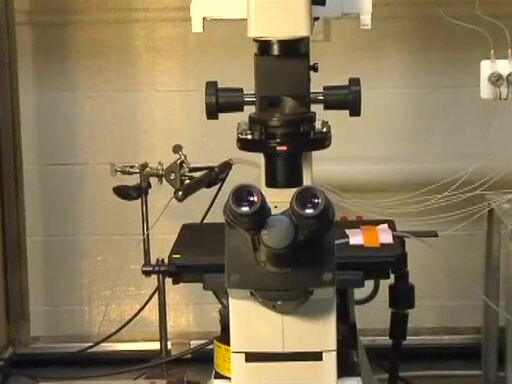 Also featured is a demonstration of tissue mounting techniques for fluorescence microscopy. Finally, examples of the broad range of applications for these techniques (and some variations upon them) are provided. JoVE Science Education Database. Biology I: yeast, Drosophila and C. elegans. Drosophila Larval IHC. JoVE, Cambridge, MA, (2019). Drosophila melanogaster is a widely studied model organism due to its versatility and facility of use. Immunohistochemistry performed on Drosophila larval preparations is an invaluable method that can provide information on the presence, location, and the co-localization of proteins. This video will cover the essential methods for the dissection, fixation, blocking, and mounting of Drosophila larval tissue and examples of their applications. Immunohistochemistry is a process that uses modified antibodies to target, bind, and ultimately visualize specific proteins in tissue. Immunohistochemistry of Drosophila larva hinges on proper dissection, which demands accuracy and timeliness due to the sensitivity of larval tissue. Dissection is typically done in phosphate buffered saline, or "PBS" for short. Upon extraction organs are temporarily placed in PBS – a saline solution with the same pH as the internal pH of the larva. After dissection the next step in Drosophila larva IHC is fixation. Fixation is a process where tissue is placed in a diluted formaldehyde-based solution, which preserves tissue. This fixing solution prevents the enzymatic breakdown of proteins in tissue. Following fixation, several washing steps occur throughout the immunostaining process using PBS containing Triton-X, called PBST. Triton-X100 provides a small amount of detergent that serves as a surface tension breaker and permeabilizes the cell, allowing antibodies and other reagents to enter. After fixation and washing, the tissue is ready for blocking. Blocking solution contains proteins that bind to tissue and occupy non-specific binding sites to which the target-specific antibodies would otherwise adhere. Blocking helps to prevent a false positive protein signal. After blocking the tissue is prepared for staining. Staining incorporates highly-specific "primary" antibody that binds to a target protein called an antigen. A "secondary" antibody conjugated to a reporter molecule binds the primary antibody. The reporter molecule emits a localized signal that can be visualized, which is often fluorescent in nature. Following each antibody incubation step, excess antibody is washed off to remove any antibodies that have bound nonspecifically. After the staining process, the sample must be mounted. In order to see the results of staining, the tissue must be carefully mounted onto slides. 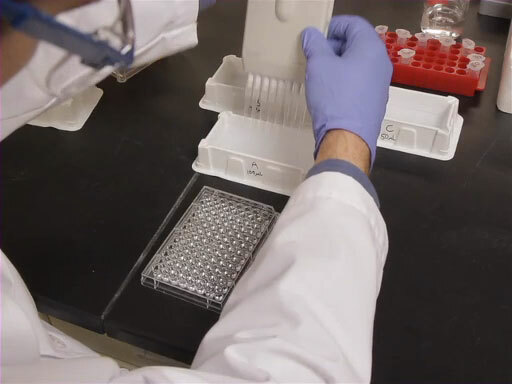 A thick reagent or mounting medium is used to encase the tissue. The sample is then ready to be viewed under the microscope. Now that we've gone through the principles of Drosophila immunohistochemistry, we're ready to see how it's done. 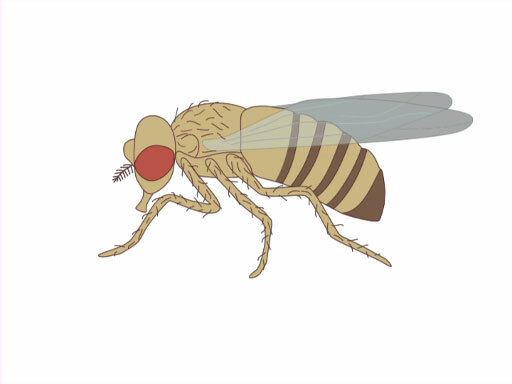 In this video we'll focus on the reagents, tools, and processes used in the immunohistochemistry of the Drosophila larval brain beginning with fixation. The process we are following uses the entire brain and is known as whole mount staining. While the dissection procedure differs depending on the tissue type used for the experiment, the major steps of IHC remain the same so we'll skip to the fixation step. Once dissection of larval brains is complete, remove PBS with a pipette. Add fixative and incubate for according to your specific protocol, for brains use 23 min. Following fixation, wash samples four times in PBST. Incubate samples in blocking solution for at least 30 min room temperature. Using the appropriate dilutions, incubate in primary antibody solution overnight at 4 °C. After the incubation period wash brains four times in PBST with a pipette tip at room temperature. Incubate the samples in secondary antibody overnight at 4 °C in the dark to prevent the fluorophores from bleaching. Again, wash brains four times in PBST. Equilibrate the brains in mounting medium for one hour. After equilibration transfer the brains to a slide using a p200 pipette with the tip cut off. Place spacers around the sample to prevent it from being crushed. Place a coverslip over the samples. Now that we've covered the immunohistochemistry of Drosophila brains, let's go through some alternative ways of applying IHC procedures. Alternative dissection and fixation techniques can be used to prepare Drosophila larva for imaging. In this experiment, researchers want to learn how cells generate specific shapes. They do this by tracing the morphologies of larval tracheal terminal cells. The researchers take advantage of a mutant fly line that expresses GFP. Larvae are selected under a dissection microscope with fluorescence. Flies emitting fluorescence indicate successful activation of GFP. These flies are submitted to an alternative form of fixation by heat; no dissection is necessary. After using software to assist tracing, cellular morphologies of tracheal branches and lumen are identified . The Drosophila ovary is an excellent model for understanding how stem cells interact with their cellular environment. IHC of Drosophila ovaries begins by identifying Drosophila females by presence of ovaries versus testes, which are apparent in males. Collected female larvae are transferred to individual wells where they are carefully dissected to obtain a structure known as the fat body, which houses the ovaries. Fat bodies are fixed and stained, and then - after placing the tissue on slides - the ovaries are separated from fat body tissue. After mounting and visualizing the slides, fluorescent staining reveals the location of somatic cells and primordial germ cells in the larval ovary . Immunohistochemistry of Drosophila larvae has many parallels to pupal and adult IHC. For example, researchers can use IHC to look at Drosophila retinas at different developmental stages: larval, pupal, and adult, thereby illustrating the difference between pupal, larval, and adult immunohistochemistry procedures. Results show the various stages of development of Drosophila retinas. Immunohistochemistry of Drosophila larva is a tool with a large amount of applications and variations. In this video we covered the procedures for immunostaining larvae including dissection, fixation, staining, and mounting. Thanks for watching!